Welcome to my Trip Report on Asiana Airlines! My goal for this trip is to complete flying all the Korean regular airlines and trust me its not an easy task, thanks to some of the airlines' "user-friendly" websites. Somehow I managed to do it and if there are any new airlines, I will fly up to fly on it depending on money and time. More airlines in my flight logbook, the better for me! I wanted to fly with this airline in May 2014 but the website gave me so much problem (sadly the problem is still ongoing) that I gave up and flew with Eastar Jet's Boeing 737-700 ride from Jeju to Gimpo.The 3rd party websites do offer flights on the airline's domestic route but the price was at least 3 times more than what the airline's website was offering. Not going to pay an exorbitant airfare of S$200 for a 50 minutes ride when I can get it for $80. So I thought maybe I should try again on the next trip, on an international route instead. 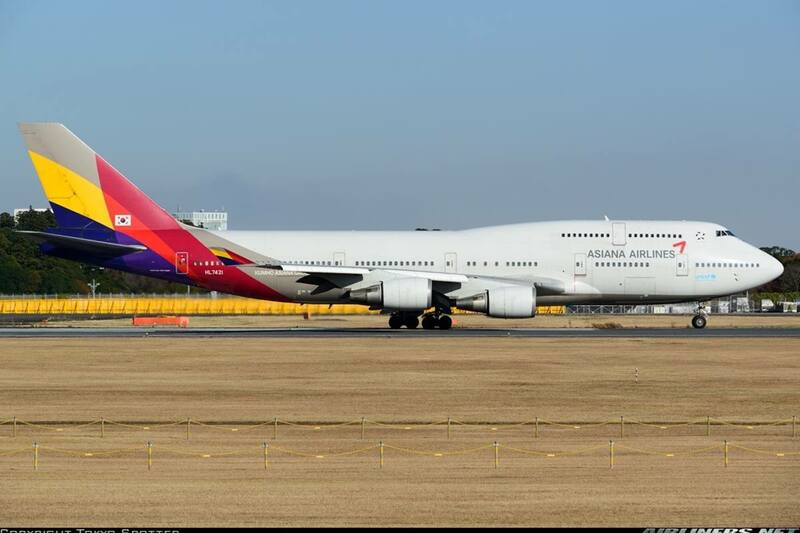 About half a year later, the thought of flying with Asiana Air surfaced again and I was thinking which route should I do. Domestic flight on the airline's soon-to-be retired Boeing 767 or the airline's flagship - the Airbus A380. Once I decided to go to Seoul in March 2015, it was a no-brainer that I would fly on this airline at least once on a domestic route and the Boeing 767 would be my pick among the aircraft types: A320, A321, A330 and this aircraft. 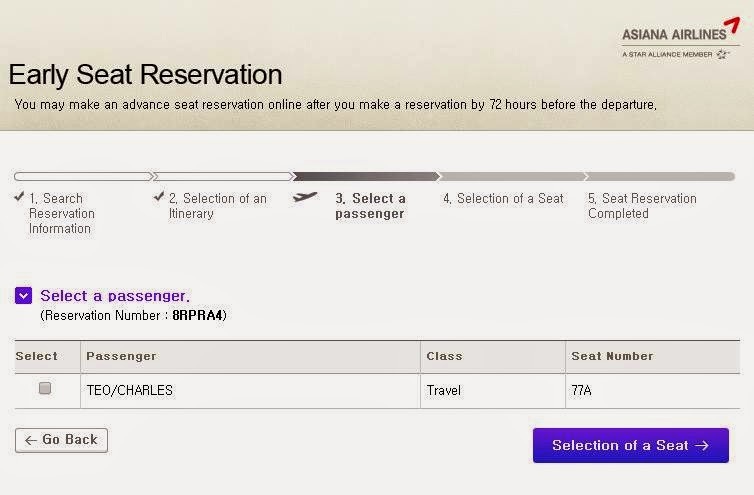 My initial plan was to fly up to Seoul on Ethiopian's Boeing 787 to add to my Boeing 787 rides, but later on checking through the 3rd party website: Cheapticket.sg, I came across a very good airfare on this website, S$450 for Asiana return and I get to log both Boeing 747-400 Combi and Airbus A380! Needless to say, I went ahead with the booking, being afraid of losing such a good deal. 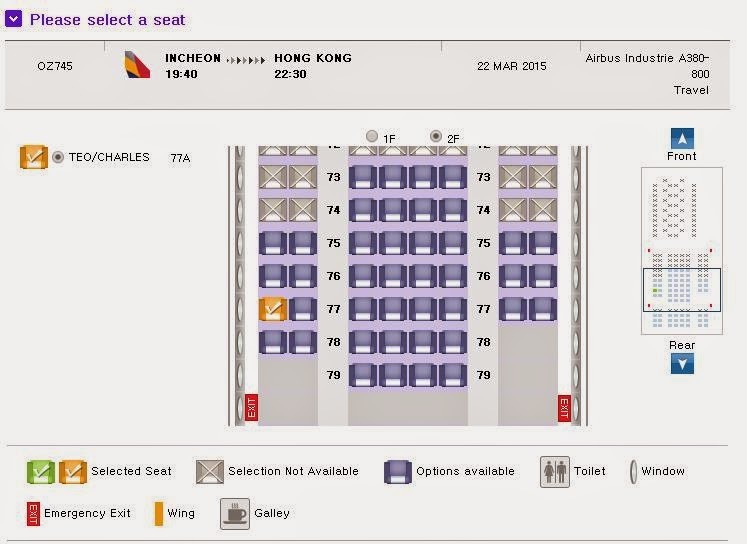 On a separate ticket, I booked myself on Scoot's 787 Dreamliner to HKG, that means I can kill two birds with one stone. 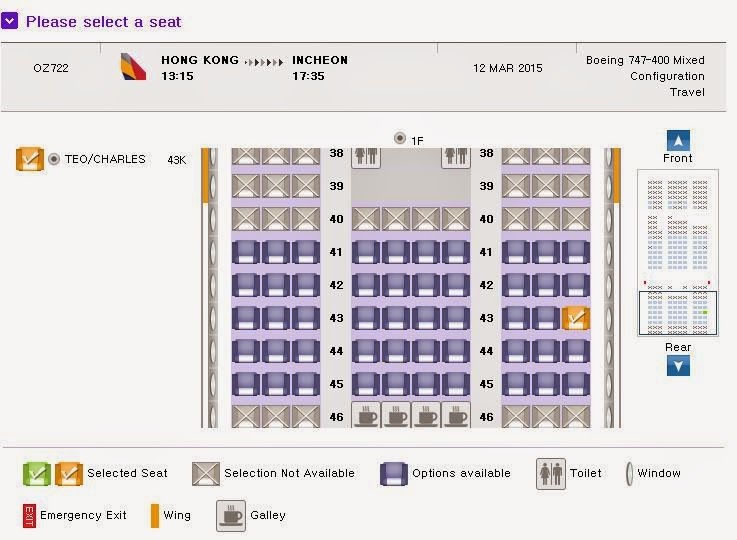 Scoot (SIN-HKG-SIN) + Asiana (HKG-ICN-HKG) + $400 plus = SQ's Y Class ticket for SIN-ICN-SIN. Which is more worth it? You decide. After that, I decided to go ahead with the booking of the domestic flight (CJU-GMP) via the airline's website but to no avail. The 3rd party websites were selling this sector for $200 while the airline's website was selling at $80, no-brainer right? I managed to reach the payment page but after clicking on the 'continue' button once I was done keying in my credit card details, the page hang on me and I had no choice but to close the page. Tried numerous number of times on Chrome Goggle and Internet Explorer, but nothing worked. So I gave up and try my luck at the office instead. I did make a call to the airline's local hotline but to my disgust, this agent was incompetent. She cut me off a few times, refusing to listen my problem and sounded more like an angry passenger than a customer officer. Instead, I ended the call. Finally, I gave up and gave my business to Korean Air which was slightly more expensive, $95 for one way (GMP-CJU) for a Boeing 777-200ER ride. For the return sector, I decided to fly with Jeju Air since the airline was offering S$40 for the one way and as for Jin Air, I managed to book it at the Gimpo Airport which cost me S$200 for the return flight, but the good thing was I get to fly the airline's only Boeing 777 which was used for Jeju operation 4 times daily at that time. Even though the flight is short, the demand for GMP-CJU is pretty high! I used cheaptickets.sg to purchase the ticket. 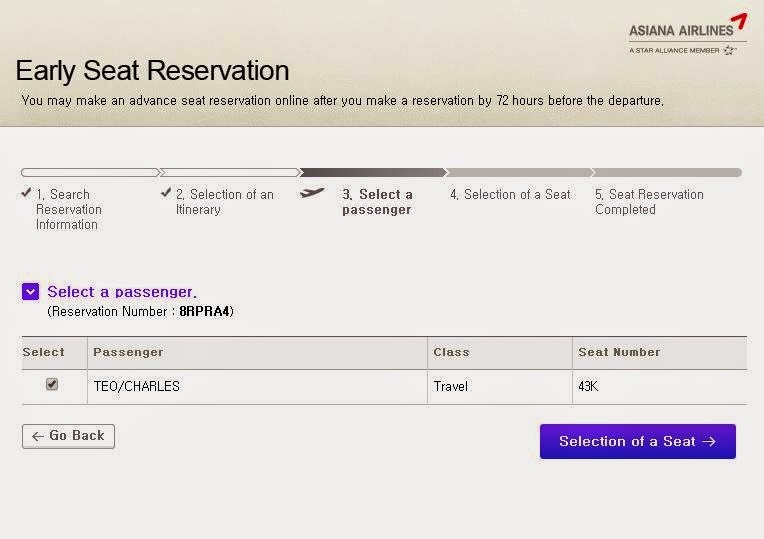 After that I used the 6-digit PNR code to try to check my reservation, however the website only allows you to use 'manage the booking' option if you book your ticket via the airline. Fortunately, my 'Flight 3' application recognised the booking which means my ticket was confirmed. After that, I did a search on the website for seat assignment and thanks to 'Flyertalk' members, I had my seats assigned. I picked an upper deck seat which is in the more comfortable lay out of 2-4-2. Unfortunately I had to make changes to the date of departure, that means money to both the airline and cheaptickets.sg. $180 to Asiana Airlines for the change and the difference in fees and $120 to Cheaptickets.sg for the chance, I was reluntant to make the changes but had no choice at that time. I did my online check-in before my Scoot flight and surprisingly had no problem checking in. Looks pretty full, just hope that the aircraft would not be changed at the last minute to the common type, Boeing 777 or Airbus A330. If you want to make a seat reservation with this airline, click on this link. After landing at Hong Kong, I went to grab some breakfast and rested for a couple of hours. It was at around 10.30am, the check-in counters were opened and I got my boarding pass not long after. Useful information to check which row your airline is. Got my boarding pass and I was off to Seoul! Checking the gate of my flight and gate 17 was where I headed to! For lunch, I decided to have it over here and try their congee. Had the pig's intestine congee and it didn't disappoint. After that, I did a check on my phone to see which aircraft would be flying me to Seoul! My ride to Hong Kong, 9V-OJA (Scoot) was flying back to Singapore. I was pleased to see the Boeing 747-400 Combi, HL7421 was taking me to Seoul. This was to be my 4th time flying on this type, my previous flight experience with the Combi was with EVA Air. I made my way to the gate after the delicious lunch! The Silverkris Lounge of Singapore Airlines in Hong Kong Airport. It was empty at that time but when the time came closer, it was packed with passengers of this flight. 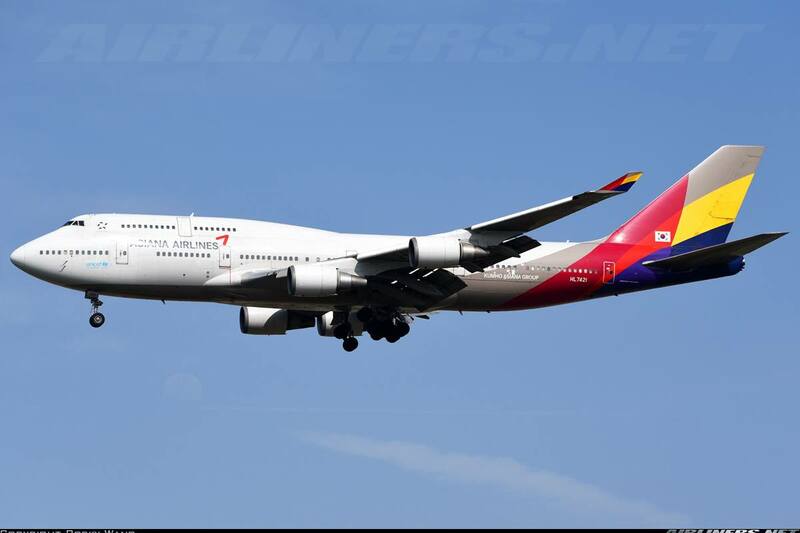 The Queen of the skies - the Boeing 747-400 Combi, HL7421 arriving from Seoul. So happy to be finally adding this airline to my flight logbook! A few more photos of this beauty, thanks to the airliners.net photographers! Once boarding announcement was made, a long queue of passengers formed quickly, I was near the front. I prefer to board early and settle down at my seat before my seat mates arrived. Once at my seat, I took some decent shots of the cabin. The walk from the 2nd door to the last row of seats was not long as this was a Combi which means the last section of the aircraft was for Cargo, and they load the cargo via a door just behind the last few rows of Y class. Interesting, right? Unfortunately, this aircraft was to be last generation in its era to have both Cargo and Passengers on the same deck. A good mix of Korea and Hong Kong passenger were on my flight and what language do they use to communicate with one another? English. I find the seat colours quite warming. I managed to take these shots before the crowd came in. The seat pitch is decent, in fact its quite comfortable for a short haul flight. I think I would be able to handle ICN-JFK flight which is more than 10 hours. Unlike EVA Air, the IFE system on this aircraft is dated. Overall, I find the seats comfortable for my liking and its better than some of the 747 operator's Y class seats. No USB port and AC adaptor, just a simple IFE system that offers a limited number of movies. The remote control is at the side, however the screen is touched-screen so you don't need to use the remote control to change channels or adjust the volume. The seat pitch was fine for me, its around 33 inch if I am not wrong. I would prefer to have a cup holder without having to open it up. Some photos of the IFE screen. Finally after all these years, I am on board an Asiana's aircraft! Its been tough trying to book with this airline and finally I did it, but at a price. My favourite entertainment: the in-flight map! If my seat besides mine is vacant, I will use the IFE screen on that seat and set it to flight map mode while watching a hollywood movie on my set. Once I stepped into the aircraft, I was greeted by the Korean crew who greeted me with enthusiasm in Korean. As most of us were Asians, it was hard to tell who were Koreans and who were not. Credit to the crew, they recognised who were not and spoke to us in English. They have photogenic memory I must say! I heard a lot of positive reviews about Asiana's service being top notch and one of the reasons why this airline is in Skytrax's 5 star rating. I have to say at that point, I was pretty impressed. Being smiled and warmly welcomed by every crew standing at one of the rows made me feel welcome and I was looking forward to the flight. Sitting beside me were a Korean couple, spoke very little English but they were friendly and the guy taught me how to mix the Korean dish and more of that in my later part of the report. Even though we pushed back later than the scheduled time, because of last minute passengers boarding the aircraft and delay due to ATC (Airport Traffic Control) issue, we made up time and arrived at ICN just slightly after the scheduled arrival time, not the airline's fault. We took off at runway 07R and soon the selt belt sign was turned off and the crew started working. It was time to explore the IFE system while waiting for the meal to be served. I watched the in-flight map for a while before deciding on catching a blockbuster movie: The Hunger Games (Mockingbird part 1), I did watch it before but I felt like watching it again. This IFE system is AVOD (Audio Video On Demand), this means you can pause, fastforward or rewind it any time you want. What was provided for us? Headset - average quality. I had to increase the volume to the maximum. Cold towel was provided. The crew came not too long after to collect the used ones. Soon after, the in-flight meal was served and it was the right moment too as I was starving. I had a choice between the Korean food (Bibimbap) and Western food. The Bibimbap consists of steamed rice, Minced Beef and Assorted Vegetables. Gochujang, a red chilli paste and sasame seed oil is added to it and its quite delicious! I must have a local beer where ever I go! It came with a cup of warm soup - quite nice. The famous Kimchi, do you like it? Well I do, unfortunately I didn't finish it as I was having at bad sore throat at that time. The crew on my side were friendly and helpful and they offered me the whole can instead of just pouring some of it like some cabin crew from other airlines do. At that moment, I could understand how they were rated highly, not for the in-flight cabin but for the service that everyone on duty were polite, friendly and helpful even to foreigners. My seat mate was helpful too, seeing that I wasn't sure what to do next, he told me what to do and before I knew it, my meal was ready for enjoy! A big thank you to him if he ever reads this. While watching my movie, I do look out of the window from time to time. Here are some window shots from take-off to landing. Please enjoy! It was nice to see my home airline parking beside my aircraft. KLM's Boeing 747-400 Combi parking beside my aircraft. Taxiing our way to runway 07 Right. Off we go! It was a powerful take off but with strong vibration when the aircraft lifted off the ground, it can be nerve whacking for the nervous flyers. The weather in Hong Kong wasn't good as there were showers in certain parts of the city. Fortunately, it wasn't turbulent as we climbed into blue sky not too long after. There were small bumps during the flight and the seat belt sign came on a few times, but nothing bad. The Captain came on and make his welcome speech and updated us with the weather and all the relevant details, it's certainly nice to hear the voice of the Captain, his confidence in his speech would certainly made some of the nervous flyers relaxed. It was a smooth descend into Seoul and the aircraft was lined up for landing. We touched down on runway 33R. Both the flight and cabin crew could finally rest after a tiring trip of around 8 hours of flying from ICN-HKG-ICN and also on ground preparation. If this set of Korean crew could work enthusiastically, I don't believe why others cannot do the same. I am deeply impressed with the cabin crew and after the flight they even bowed to us and wished us a great journey, that was a certainly a great end to the flight. Arriving in Seoul to catch the sunset was a great welcome. We parked at the the airline's parking lot and I spotted 3 different aircraft model of the same airline. The biggest disappointing about this airline is the website, for being a 5 star airline and a member of the star alliance, its not acceptable at all. Having to use a 3rd party to book with this airline wasn't much of an option for me unless I head down to the office to make a booking which is possible. If I did that, I would have to pay more for the ticket and I did a comparison, the 3rd party website was selling the ticket at around S$150 cheaper than the airline's website. Korean Air has done something about this issue and I hope this airline do the same as soon as possible. I don't understand why some of these Korean Carriers wants us to use a 3rd party app to make the payment, that is causing inconvenient for everyone especially the foreigners. For more info, check out this post. As for the flight, it was a different story. The crew were simply amazing! Am I lucky to get such a good set of crew or is the service this efficient? I have to fly this airline a few more times to compare. Thumbs up to this set of crew, they have set an example to others. The in-flight meal was great as well, this airline is definitely in my recommended list. It may not have the best in-flight cabin, its make up with the in-flight service. On my return trip with this airline, I flew on the Airbus A380 which offers a newer product than the Boeing 747-400 Combi. A review would be done and you be the judge. Hope you enjoy this trip report. As usual, feel free to ask me any questions. Meanwhile for aviation enthusiasts, fly the Boeing 747-400 Combi while they are still around. For the Airbus A380 trip report, click here!